What Workout Program Will Help With Your V-Taper? TOPIC: What Workout Program Will Help With Your V-Taper? The V-Taper can play a vital role in completing and mastering your physique. This shape of your body can also make or break your success in contests. What type of program can you follow, or how can you revise your program, to achieve the V-Taper? To your physique, how important is the V-Taper? Bonus Question: What IFBB Pro Has The Best V-Taper? The worst V-Taper? Why? Workouts For Building An Impressive Physique- Creating The V Taper! Let's talk about training! I bet there are a lot of us who have just been going to the gym with one goal - to add mass, or decrease fat. This is a general goal, and will probably make us bigger and stronger in the end, but let's take a closer look at our physiques. Since we are bodybuilders, we should know that training should be used to bring up weaknesses in your physique or help to shape your physique in some way or another. I bet one thing that we can all agree will make our physiques look awesome would be a better V-taper. So how do you train for this? Well, there are a few things that "create" that V-taper look. These muscles are the back, the deltoids and the waist. This is because the V-taper look comes from having an upper body width which contrasts greatly with waist size. In other words, somebody with wide shoulders, and a very thin waist, will definitely have a great V-taper. So how do you achieve this V-taper? Seems like a lot to worry about. Well, I am going to present to you a workout that will emphasize the V-taper look. There are also some muscles that you won't want to train too much. For example, people with very high traps will know that they take away from the V-taper look. I will address every aspect of training in this article that will add to your V-taper, including ways to add to the illusion of a V-taper by leaving some muscle groups, which may take away from the look, at maintenance. There are many qualities that a bodybuilder's physique must have to be considered aesthetic and for a bodybuilder to do well in competitions. These qualities are all about the body's proportions. Some of these qualities are having calves and arms that are similar in size, having a neck that fits a bodybuilder's head, and a balance in the chest and shoulders so that one does not overpower the other. None of these little aspects of proportionality in the physique is as noticeable as the V-taper, though. Even for non-competitive bodybuilders, a V-Taper can make your physique look ten times better. A V-Taper is the sign of a bodybuilder that trains hard and eats right. It demonstrates dedication and strength. It also makes your muscles appear bigger because they are contrasted with your small waist-line. The cardio will help you stay lean, while the back and shoulders will get some extra growth due to the increased frequency of training. Read on to find out the specifics! It seems like when I hear the term "V-taper", the first thing I think of is a wide back. A wide back will help add to the V-taper by expanding the shoulder girdle and making the shoulders wider! There are also some back stretches that are known to manipulate and stretch the shoulder girdle to make it bigger, which will add to the V-taper even more. So how should you train the back? First of all, you are going to want to focus on the lats and training them on a VERTICAL plane. You will still do a HORIZONTAL motion for lats, but your back workout will be mostly filled with vertical movements. This is because horizontal movements add more to thickness, which will not create a V-taper as much as adding width will. Having thickness in the back doesn't necessarily take away from the V-taper look, but you will want to place more of your training energy into what really counts for back- the width movements. Something you really want to work on is your focus on your back, especially during the width movements. You want every exercise to count the most. In fact, I'm sure that as soon as you get the hang of feeling the back during training, you will see a big jump in lat development. If you are not great at focusing on the lats, well today is your lucky day. The first thing you will want to do during your back movements is pick 75% of your regular weight. Now, without moving your arms, pull your shoulder blades down. You should move the weight down 2-to-3 inches. Now, maintain that contraction, and pull the weight down to your chest, the whole time focusing on that same contraction that you got from pulling the shoulder blades down alone. Then pause at the chest, and make sure you are still feeling the back work. Did you maintain the contraction in the back? Well, keep doing reps like that. For me, learning to contract the back alone wasn't an immediate thing. I had a month of tough back workouts before I got the hang of back training so that I could REALLY feel the muscle working. So just be patient, and in the end your new ability to focus on the back will be worth the trouble. Stretching the back is also very important. One technique that might help to manipulate the shoulder girdle is hanging from a pull-up bar with a wide grip for an extended period of time at a full stretch. This method of stretching could be beneficial to your V-taper, allowing for more shoulder width. I would recommend this right at the end of your back training. One muscle group that you don't think of immediately when thinking of the V-taper, at least if you are me, is the delts. However, building a big, round set of delts will definitely make your shoulders look much wider! When training for the V-taper, you are going to want to place a lot of emphasis on delts, and maintain traps. The traps are a V-taper killer. If you build your traps so that they are too high, it will make your shoulders look narrower! That is not what we want at all. You want to maximize how wide your shoulders look. There are three heads of the delts - front, side and rear. While the side delts are key, the front and rear delts are important too, so that people will see a strong shoulder development from all angles. There are two ways to train the delts - laterals and presses. A common shoulder workout will start with a press, then do multiple variations of lateral raises. For the traps, you would usually do shrugs too. For your shoulder workout though, you won't be doing too many sets of shrugs, so that you can just add to the illusion of shoulder width. The reason that I say "illusion" is that you can manipulate your physique so that your shoulders look wider, by limiting growth in other muscles such as the traps and obliques. They key to emphasizing delt growth, instead of trap growth, is focusing on the mind to muscle connection in the delts while doing these movements. A lot of times, the traps will take the load away from the delts, especially in lateral raises, so we have to be sure to pay attention to what muscle is doing the work! When you use a swinging motion to lift the weights on laterals, the traps come more into play, and the delts are removed, because the traps are more capable of this heavy load. In order to really stimulate the delts, you will need to go over to the light dumbbells and just focus on leading the weight up with the elbows - this is key to building delts and isolating them from the traps. In fact, I rarely go over 20 pounds on side laterals when I use a form like this, and usually stick to 15-pound dumbbells, which seems to get the job done well. My delts are never more sore than after I do laterals like that. Since lateral raises effect such a small area of the muscle, I generally prefer doing more sets than I do for the average exercise when I do a lateral exercise. I sometimes do 5-or-6 sets of side lateral raises, along with everything else, and by the end of the workout my delts feel great. Laterals are not taxing on the body as a whole when done right, so you should be able to do lots of sets like I do without overdoing it. While the back and shoulders must be built up to encourage a strong V-taper, the waist plays a different role. The waist's role in the V-taper is to be so thin that the shoulders have an illusion of being even bigger than they already are. We all know that when we bulk, our waist size increases, but this can be limited. If you want to keep your waist small, there are a few things that you can do. The first thing that you can do is limit the amount of growth that takes place in your obliques and lower back muscles. This means that you should not be placing too much emphasis on movements such as deadlifts which train the core heavily. Deadlifts will take away from your V-taper. Now, some of you might think that without deadlifts, you will not grow! This is not true. In fact, many powerlifters leave deadlifts out of the routine for long periods of time and still get great results. We can relate this to bodybuilding because we bodybuilders can also leave deadlifts out for a while and make solid mass gains. You should also limit direct oblique training so that your obliques don't grow too wide. The obliques, since they are on the very sides of your waist, can easily take away from how wide your shoulders appear to be. And don't be fooled - doing lots of high rep oblique work will not help you cut fat from your waist, in fact, it will make more of a problem for you. Core training is important for safety, though. This is why I think that you shouldn't take out core training altogether. I will be including squats, abdominal and lower back work so that our core strength does not atrophy. Also, keep in mind that your waist might not shrink much while you are adding mass to your back and shoulders, but you can keep it from GROWING too much through a clean diet and cardio. Keeping a healthy diet and doing cardiovascular training while you gain weight will make sure that you don't gain weight too fast, because if you do, you will find yourself gaining much more fat than you need to. Now that I have explained my methods for creating this program, let's get into it. I am going to make recommendations for everything that you should do to build a V-Taper in this section. Click Here For A Printable Log Of Day 1: Back/Shoulders. Click Here For A Printable Log Of Day 2: Chest/Arms. Click Here For A Printable Log Of Day 4: Legs/Abs. Click Here For A Printable Log Of Day 5: Back/Shoulders. Find a place that is a distance of 100 meters, or 110 yards. Put my things down on one end of it. Warm up by jogging back and forth twice. Sprint at 7/8 speed to one end. Rest until I catch my breath, stretching in between sprints. Repeat this ten to fifteen times (depending on how energetic I feel). I feel that this is a healthy way to perform cardiovascular training that will not hinder muscle growth or fatigue me too much, so that I can train hard and keep up with my cardio. Also, be sure to keep in mind that eating a clean diet with natural and whole foods is the best way to add muscle while minimizing fat gain. Try to try out new supplements from www.bodybuilding.com/store now and then, and see what works for you to create faster mass gains. Read up on pre- and post-workout nutrition, and how those two aspects of diet can really maximize your results. Take pictures after every few weeks, to see what is lacking in your V-Taper - you will know what you need to work on more by looking at the pictures. Look for flaws such as, do you need more back width? Are your side delts overpowering your front delts? Do you need to take a few weeks to drop fat, so that your waist is smaller? Be determined! Your hard work will pay off! Keep your back straight and chest out on all exercises. Use a slow negative - 2-to-4 seconds - and then press as hard as you can to lift the weight. Keep rest periods below 2 minutes to cause growth faster. Always focus on the muscle you are training! Even during a grueling leg session, you must concentrate on using only one muscle group to move the weight. Unless otherwise stated, you should always try to progress in weight, as long as you can stay in your rep range and use good form. When you are looking for a reason to get that last rep of pulldowns or military presses, or thinking about taking off a sprint during your cardio, just think about Brian's incredible V-Taper. Brian is a bodybuilder that we might not all know about, but he definitely deserves our recognition. He is one bodybuilder who must have small joints, but still places a huge amount of effort into his back and delt training. Also take a look at Sergio Olivia and Dexter Jackson, some more popular bodybuilders who will always be remembered for their awesome V-tapers. Mike Sheridan just made it into the top 21 for Mr. Olympia in the 2005 Olympia. That is an accomplishment, even if it is not a victory, something I would be proud of. But it is pretty clear why Mike Sheridan didn't place higher. His shoulder width just isn't there, and it is clear in that picture above. He has great conditioning, legs are looking great, traps aren't too big, but his shoulders just appear very narrow. In fact, they look almost as narrow as his waist! This picture should demonstrate the importance of a V-Taper to us bodybuilders - it shows that a strong V-Taper can make the difference between an Olympia win or just making it into the top 21. Mike Sheridan looks like he still has a long time to train for his next entry into the Olympia, though, as he looks young - it's entirely possible that he will come back with wider shoulders and take a higher placing! After reading this article, you should know that the V-Taper is an illusion which makes one's shoulders look wide that is created by a contrast of back and shoulder width with waist lean-ness. I discussed ways to maximize the appearance of shoulder width through training. I also talked about how a bodybuilder can keep their V-Taper improving by using cardiovascular training to limit fat gains, and what other muscle groups should be trained only at maintenance so that they do not take away from that V-Taper look. The V-taper is extremely important to bodybuilding, and it is something that can be achieved through hard training, and training that is specific to our goals. With the routine that I outlined above, the back and shoulder muscles are emphasized while fat gain is kept to a minimum. The back, deltoids and waist are all the keys to creating that V-Taper look. Somebody with wide shoulders, and a thin waist, is guaranteed to have an impressive V-Taper. Make sure to take a close look at how your physique is changing every now and then, and adjust your routine as necessary. Use the great size of the top bodybuilders as motivation, this intense routine and show your determination and dedication by sporting a V-Taper. A good back is consisted of two qualities: the V-taper shape and overall thickness. A V-Taper can be defined as the width of the shoulders compared to the narrowness of the waist. This V-taper appearance will either make or break your success in bodybuilding and fitness contests. The lat muscles that provide the V-taper are particularly important for bodybuilding and fitness competitors, as a more pronounced V-taper shaped back will give the appearance of a smaller waistline and much more broader and larger shoulders. Look at bodybuilding greats Ronnie Coleman and Dorian Yates - both who have dominated Mr. Olympia contests from time to time. Both also displayed unprecedented back thickness and amazing V-tapers. Their dominance in past bodybuilding competitions can easily be attributed to the V-tapers they presented. Therefore, really emphasizing and focusing on training the back - with the proper techniques I will mention below will guarantee a combination of overall back thickness and the desired V-taper appearance. Focusing on your shoulder training will result in "boulder shoulders" and much broader deltoids, which in turn will help your V-taper appearance by making your waistline appear smaller. Although it is vital to really focus and develop a connection with your back and shoulder training, the rest of your muscle groups should not be neglected in your training. Your body grows as one unit; therefore, only training a few selected body parts (in this case, shoulders and back) will provide poor results. By training all of the muscle groups in your workout program, you will experience more growth and even greater development. By dedicating an entire workout to training shoulders on day 3 and back on day 5, your "mind muscle connection" will be at it's highest - resulting in a greater stimulation of the shoulders, which in turn will result in more growth and an amazing V-taper! With the use of special techniques on shoulder days and back days, you can maximize your training and develop the V-taper appearance more efficiently. Many trainees don't realize that the back is actually the second largest muscle group in the body (legs are the largest). When training the back, it is ideal to focus on two components of a great back: thickness and width. Movements in which you "pull" such as pull-ups, chin-ups, and lat pull-downs emphasize width. Movements in which you "row" such as barbell rows, cable rows, T-bar rows and dumbbell rows focus mainly on thickness. To truly develop a breath taking V-taper appearance, a combination of "thickness" and "width" exercises must be performed. It is also vital to maximize muscle fiber recruitment in the back by focusing on "squeezing" your elbows down or far back as possible while trying to minimize using the arms, particularly the biceps. For greater back development, always "pull" with the elbows. It is imperative to perform barbell deadlifts for a complete back and V-taper. Deadlifts really target the lower and middle back - two of the most under trained muscle groups by bodybuilders. Deadlifts are considered a power movement; therefore, once you incorporate them into your routine, your strength and power will go through the roof! The shoulder is a large three-headed muscle group, which consists of three parts: the anterior deltoid located in the front, the medial deltoid located at the side, and the posterior deltoid located at the rear portion of the shoulder. For complete development of the shoulder, all three of the heads must be trained effectively. Shoulder training can be broken down into two types of movements. These two types of movements are overhead pressing and raising movements. Incorporating a combination of overhead pressing and raising movements into your shoulder training will guarantee much more developed, broader, massive shoulders - which in turn, will improve your V-taper appearance. The trapezius muscle should not be neglected when training shoulders, since they extend down from the neck and tie in with the shoulder muscles. The trapezius muscle, also known as the "traps," are possibly one of the easiest muscle groups to add size to - as they can be trained using heavy weight on shrugs, deadlifts and some pulling variations. They will aid in completing your V-taper appearance by giving off the illusion of mountainous shoulders! When training the shoulders, remember to go through a full range of motion - executing a controlled movement. Do NOT use any other part of your body to move the weight. This is the biggest mistake I see when people are training shoulders. Remember, using good form creates better stimulation of the muscle being trained. Click Here For A Printable Log Of Day 1: Chest & Triceps. Click Here For A Printable Log Of Day 3: Shoulders. Click Here For A Printable Log Of Day 5: Back. Click Here For A Printable Log Of Day 7: Legs & Biceps. Be sure to warm-up properly before beginning each workout. Rest periods are to be between 60 and 90 seconds. Don't expect results, unless your diet and supplement regimen are in check! Remember to stay well-hydrated during your workouts. Even the slightest bit of dehydration can hamper your progress tremendously. This program really emphasizes on isolating the muscle groups associated with achieving the V-taper appearance by placing shoulders and back on their own training days. By training the other muscle groups with the same intensity and volume given to back and shoulders, the body is forced into muscle growth! I really focus on training my back and shoulders to their fullest to develop the V-taper. I have used this very program in the past, and my V-taper development was tremendous. My lats became much wider, and my shoulders were broader and larger than ever. I even had friends asking me if my waist size had shrunk - when in reality it hadn't, rather, my lat width and broader shoulders gave the appearance of a slimmer waist. The V-Taper is very important to me. I plan on competing in my first bodybuilding competition in a few years; therefore, if I plan on coming out successful, my V-Taper has to be unmatched. Like I mentioned earlier, judges really look for that V-Taper on competitors and it will make or break you in contests. What IFBB Pro Has The Best V-Taper? The worst V-Taper? Why? My choice would definitely be Ronnie Coleman. Ronnie has proven he is one of the best, if not the best, bodybuilders in the history of the sport. He was won eight straight Mr. Olympia titles. Most of those titles can be attributed to his outstanding back and V-Taper. Ronnie continues to impress the judges at every show with his breath taking V-taper and overall back thickness. 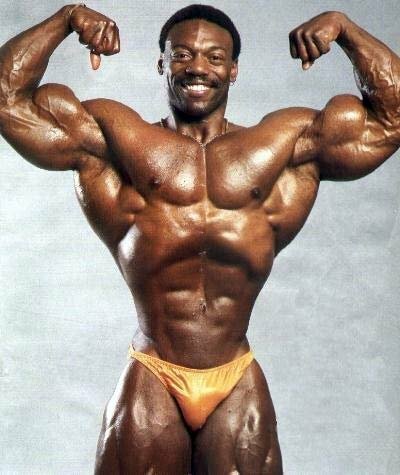 Therefore, it is the writer's opinion that "Big Ron" is the current IFBB pro with the best V-Taper. Chris Cormier, hands down. Chris failed to impress the judges at this year's Mr. Olympia, and showed up "soft" and not as hard as he usually does. He lacks the needed mass in the shoulders and lat width that contributes to a nice looking V-Taper. His waistline is a bit too "thick" and takes away from giving off the illusion of a V-Taper. Don't get me wrong, the guy is massive and is one of my favorites, but his V-Taper is certainly his weak point. This program is specifically designed to help you out with developing an unprecedented V-Taper. If you follow the training guidelines and program to a "T" coupled with a solid nutrition and supplement program, you'll have a V-Taper to envy in no time! Ask someone to imagine a bodybuilder. What do they see? Chances are they see a giant "V". Having a good V-taper looks great and it is a must for any bodybuilder. The big wide shoulders, and back combined with a small waist makes the physique more appealing and pleasant. All the best bodybuilders in the past had great V-tapers. If you are especially doing a show, having a V-taper is a must and I would put great dedication toward it, because in the bodybuilding world it's what makes you or breaks you. V-tapers are a must and if you take the time to educate yourself you will see that it's not all that hard to get a great taper. All you need is consistent training and knowing what to do. As you imagine a great V-taper most people imagine a big back. Sure that's half of it, but not all. In order to have a great V-taper you must understand what muscles contribute to it. The back is obvious, but also the shoulders and the waist play a big role especially for those front poses. Sure you don't need to focus on your waist that much if you're doing a back double bicep, but if you are doing a front lat spread your waist and shoulders have to be in top condition. The need to focus on deltoids is enormous. The shoulders make that V-taper look complete. Without good shoulders it will really stand out and you will look terrible on stage. Also the waist has to be small. Sure having big abs is cool, but don't make your waist wider than it really is. If you have a naturally small waist, and you work hard to get that back and shoulders big you will look amazing. The V-taper is a sign that you work real hard. It shows that you don't skip on workout that require more energy and are harder (back). Also it shows the consistency of your workout. Sure you can get a nice chest or big guns, but if you don't have a big back and shoulders it will really look weak compared to the rest of your physique. Also even if you don't compete you should emphasize your workout around getting a V-taper because it really completes the whole physique, not to mention that women love broad shoulders. The V-taper can play an enormous role in your physique. Look at Jay Cutler. His waist is not that small, but his back and shoulders make up for what he has on his waist and then some. Even if you aren't born with a 29-inch waist, there is still hope for you. Jay sports a 34-36 inch waist, but if you look at a picture of him you will notice that his lat and shoulders are huge and if you had to take a guess you wouldn't put his waist over 32 inches. So imagine how big of a role the V-taper makes. It rounds you up as a bodybuilder and gives you that authentic look. Bodybuilders are the only one with great V-tapers. The reason behind that is because you need to be big, and lean at the same time. Not a lot of 'athletes' can achieve that, and that's why bodybuilding is a hard sport, especially in the pro ranks and if you don't have a great V-taper, you're screwed. So how important is it to your physique? Very. If you are a pro it is a matter of life and death on stage. This workout will focus on building up your V-taper. It will be 3 days a week focusing on the three major parts: back, shoulders and abs/waist. In order to achieve best results you need to have a good bulking diet that will help you put on some meat. Also resting is an important factor in growing. Especially big muscle groups like back. Make sure to get 8 hours of sleep and also avoid cardio during the first few weeks so you can build up and then put it back in so you can maintain a nice, lean waist that will contribute to your V-taper. I also recommend taking supplements such as creatine and glutamine to help you with energy and recovery time during this workout plan. So here it is. Click Here For A Printable Log Of Monday: Back & Traps. Click Here For A Printable Log Of Wednesday: Shoulders & Abs. Click Here For A Printable Log Of Friday: Abs. Click Here For A Printable Log Of Saturday: Back & Shoulders. I believe that Ahmad Haider has the best V-taper in the pro circuit today. Why? Because he is naturally gifted with a small waist and he took advantage of that. He followed all of the information I summarized in the article and applied it to his training. He has a nicely developed back, with big round shoulders and small and defined waist. Sure he is no mass monster, but he is the perfect example of what a perfect V-Taper should look like. He has the total package and I have tons of respect for his hard earned physique and V-taper. I believe that Art Artwood has the worst V-taper I have ever seen on a bodybuilding stage. I mean that guy's waist is the size of his shoulder circumference. Who let him get on stage? Sure he comes in at a low body fat but his waist must be somewhere around 40 inches if that. If you look at pictures of him you can see how thick his waist is and how underdeveloped him shoulders and back are compared to his waist thickness. I am not the IFBB judge, but you can still see his placing and how bad he performs at contests. He is a big guy and I give him props for that, but the V-taper is the worst in the IFBB.